I found this cartoon months ago, and I love it because it so accurately describes a huge marketing mistake that too many professionals make. Enormous effort and resource is put into creating wonderful websites, facebook pages and blogs…..then……nothing! While there is an excellent and strong argument for reserving and parking your digital domains or the electronic IP that is your brand or personal name, there is not a marketing case for grabbing your “brand” while you can, creating a presence with it immediately, and then letting it languish. 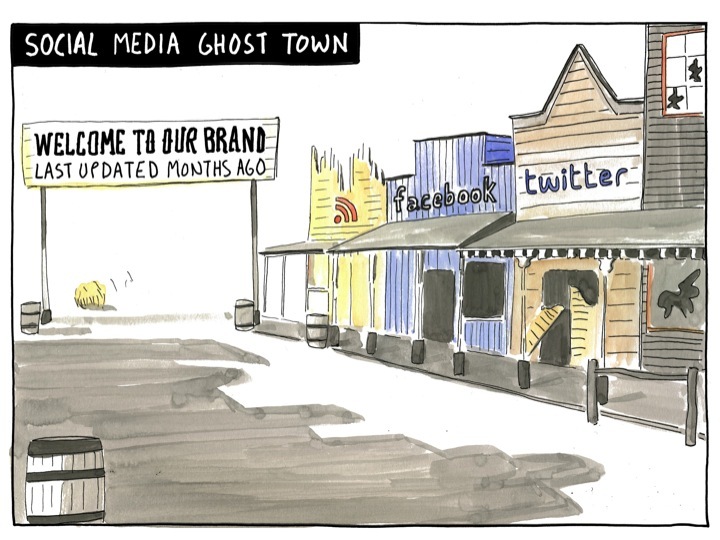 Creating a Facebook page or website for example, promoting it and attracting viewers, and then never posting anything fresh or interesting thereafter is effectively building a Ghost Town to begin with. And in doing so you have probably just wasted those most valuable “first followers”…those first followers are the ones who lead others to you and create momentum. They are immensely valuable to building your brand and your presence, and helping others in the market to find you and engage with you. Once you have decided to build your website, social media platform or blog, it is imperative that there is a strategy for continually refreshing it with new content and interesting information to maintain interest from your audience. Without the content strategy it is more likely that you will lose credibility and market engagement than create it. As with most new initiatives that involve you stepping into the unknown you can begin with small steps. A degree of caution is appropriate while you are working out how to finesse the use of your chosen platform…but there does have to be another step after the first step…and then another. A regular weekly update to a website or Facebook page is far better than a mad rush of 15 postings in 3 weeks, then silence for 4 weeks. The latter is just another way of creating a ghost town. Build a community post by post, and by being there regularly and reliably – even if it isn’t as often as others. It is about creating expectations for your audience, and then delivering to those expectations at least (if not surpassing them). For a brand to build trust it must build reliability and a reputation for delivering to expectations at least. The same principle applies to your website or any other electronic marketing platform.